When I was young, my brother and I were taken to Sears and we were each allowed to pick out a Winnie The Pooh stuffed toy. I loved my Pooh bear so much, and kissed his pom pom nose every day. My enchantment with Pooh began back then, and he still makes me feel warm and fuzzy inside. When I discovered that Verve had this Smallest Things stamp, I just HAD to have it. The butterfly stickers are from K & Co. I'm not sure about my brother, but I still have my Winnie The Pooh bear. His pom pom nose is now upturned from too many kisses, and his happy smile tells me that he enjoyed every one of them! I love that sentiment too and it looks fabulous on that doily die!! Beautifully done! This is beautiful and such a touching story. Sophie is currently in love with a Winnie the Pooh Storybook we have...we read it twice a day. Hope you're doing well and your foot is reviving nicely! ADORABLE little story and awesome card Colleen! Love it! Its lovely ! Card n sentiment both ! Precious! Gorgeous layout and colors! I too had a Winnie the Pooh since infancy. It came everywhere and he has a stitched arm from me holding it by the arm and a turned up nose too! What a sweet story and sweet card! SO fun that you found the sentiment!! Sooooooo sweet!! I loveeeeeeee that sentiment and the butterflies!!!!! That is such a sweet sentiment. I remember when I was young I had a winnie the pooh book that had a record with it. I think I wore it out I played it so much. Your card looks wonderful my friend. Thank you Colleen for sharing your Winnie the Pooh story. You know it touched my heart because I am such a bear lover. This card is just gorgeous and that sentiment is dynamic. I love that quote and have it pinned in my boards on pinterest. Love it. Your card is beautiful, Colleen. Stunning use of the stamp and stickers! Fun story too - I had a bear called Pinkie -- and yep he was well loved too! Awww..what a sweet story! Your card is so pretty! 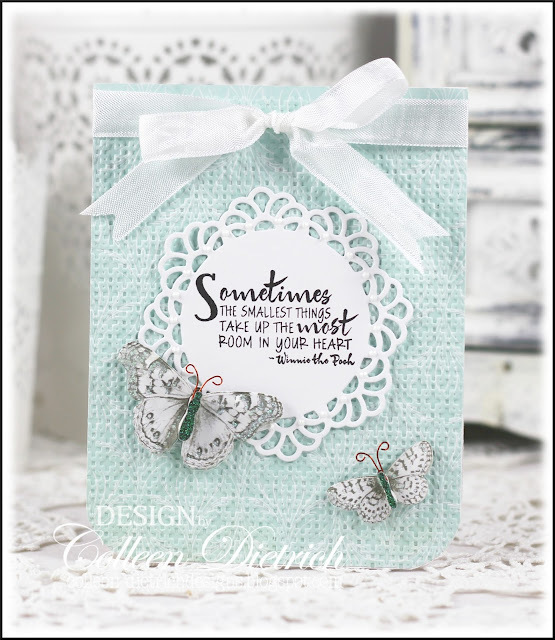 I love that sentiment stamped on the doily! Winnie was a wise bear. I had a Teddy like that. He's no longer with me, but funny that I still think about him now and then. That was a long time ago. This is such a pretty card, Colleen! I especially love that soft blue houndstooth. It reminds me of a baby blanket. Beautiful! The color on the folder is fabulous. Sweet story about your Pooh Bear. 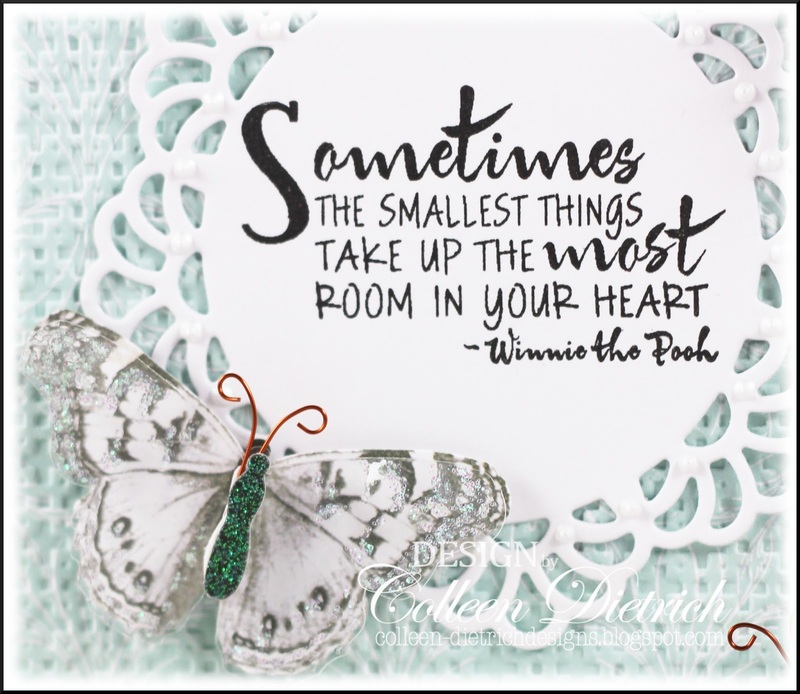 What a great sentiment - so sweet and this card is really sweet too! Hugz!